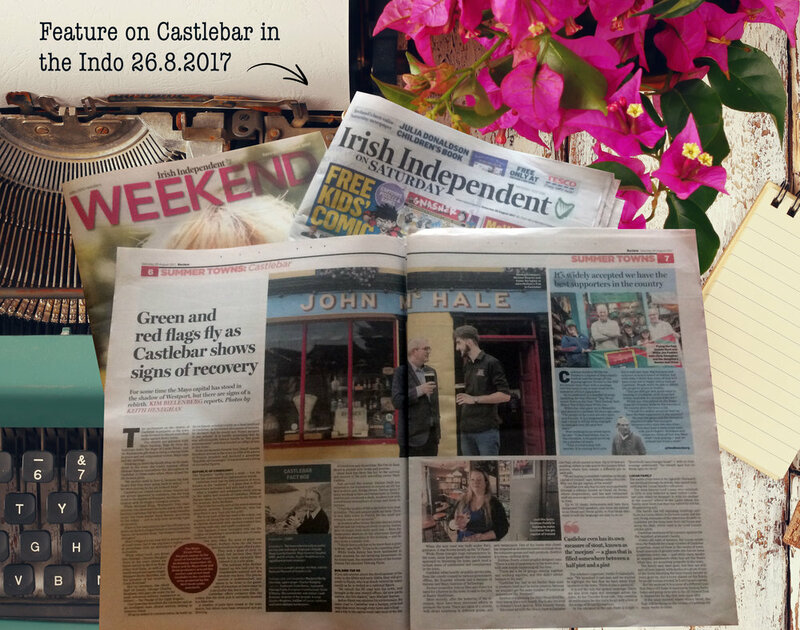 Castlebar Gin Trail’s Bridge St bar named in The Guardian’s 20 Best Pubs in Ireland. Click on the link below to read the full article. The good news is, Castlebar Gin Trail is open every day come rain, hail or shine and you can always find a great Gunpowder G&T at Coadys Bar, Castlebar, Mayo (be warned, however – there's every risk of ice!). Please keep an eye on our Facebook page and website for details of the rescheduled event. We hope you'll be able to join us next time. GINGLE YOUR BELLS THIS CHRISTMAS WITH A GUNPOWDER MASTERCLASS! Winning Spirits In Castlebar: 51 Gins For Match Day! As the big match day approaches, Castlebar Gin Trail is getting into the spirit of things by bringing the total number of different gins in town to 51 – Mayo football's magic number! Here's hoping it will bring some luck to the Green and Red this weekend. Raise a glass to Bridge Street bar for getting our 51st ginspirational goal over the line with the addition of floral Bloom, juniper-rich Listoke, Icelandic spring water-laden Martin Miller's and spicy Opihr gins. Better tog them out with a green and red garnish to be on the safe side! When he visited the town, Kim spoke with several local residents and businesspeople, including events co-ordinator Michael Baynes, Bar One's Mark Cadden, Castlebar Gin Trail ambassador Siobhan Foody and Bridge Street's Declan Swift. Photographer Keith Heneghan documented the visit. 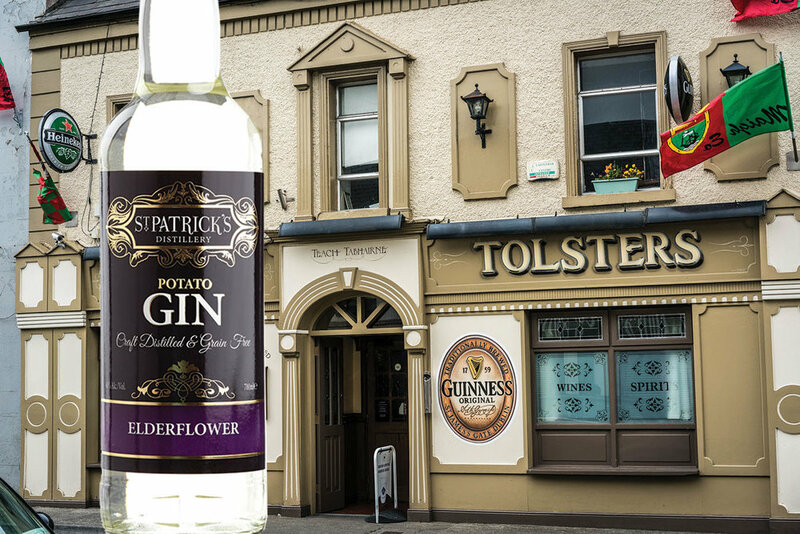 Castlebar Gin Trail is delighted to welcome Westport native Cyril Walsh from St Patrick's Distillery in Cork, to Tolster's Bar on Spencer Street, Castlebar, on Friday, September 1 for a very special gin tasting evening. Starting at 8pm, Cyril will be offering tastings of St Patrick's elderflower potato gin, as well as the opportunity to learn more about the distillery and its award-winning range of drinks. There will also be a competition on the night! Sloe and seaweed gins now in Castlebar! There are some very interesting new gins in town this month. St Patrick's Sloe & Honey Gin has made it onto Bar One's excellent new drinks menu. The ruby-hued gin is made by Westport native Cyril Walsh and his team at St Patrick's Distillery in Co Cork and is a sister gin of the St Patrick's Elderflower (on the gin trail in Tolster's). The distillery says: "Our sloe gin is a full strength 40% alc., and its base is potato spirit, distilled from Lady Claire and Rosetta potato varieties. We have resisted the temptation to add sugars to our gin, and have retained the natural tartness of the sloes, tempered with just a little drop of honey. This is an extra dry gin, with a crisp tart expression. Unlike our other gins, this is best enjoyed with a quality mixer or our preference is ½ a squeezed lime and a quality ginger ale mixer." It's also excellent in cocktails. Try a SloeGasm! Add sugar syrup to sloe and honey gin and top with dry prosecco! 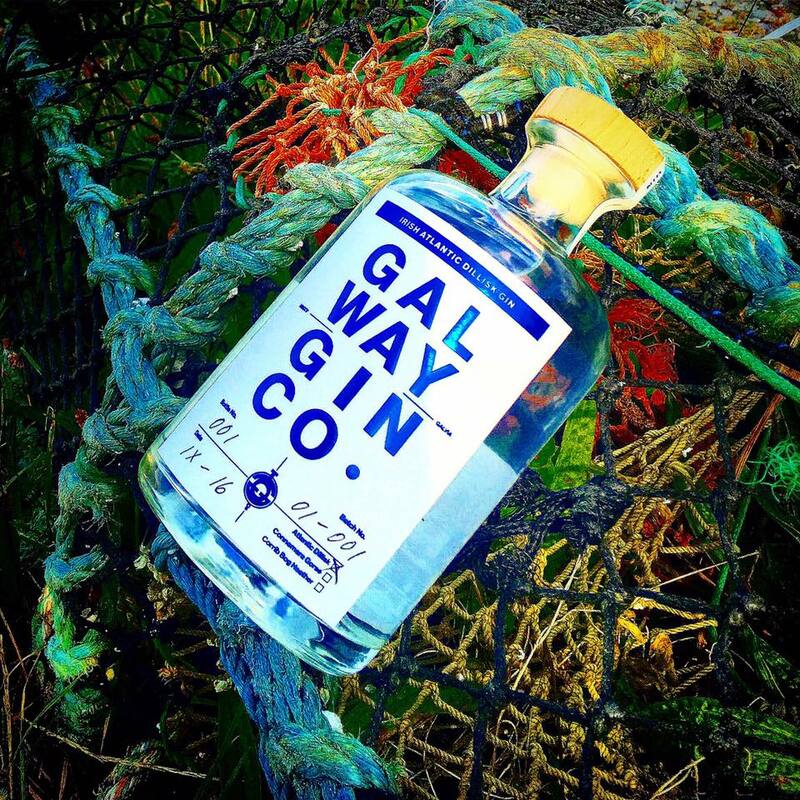 Galway Gin Co's first offering is a dillisk infused gin and it's now available at Bridge St in Castlebar. Aroma: Light nose of dillisk and lemon, pleasant and refreshing. Taste: Floral and pine start with a lovely hint of dilisk and lemon carrying through to a slightly spicy finish. Music trail in Castlebar for August Bank Holiday Weekend! Click here to view and download the full line-up! Castlebar publicans are bringing a six-day music trail to Castlebar this coming August Bank Holiday. Starting on Wednesday, August 2 and running until Monday, August 7, the line-up includes everything from trad to pipe bands to vinyl tunes and the best local live acts. Castlebar’s social scene is enjoying something of a renaissance at the moment and building on the continued success of the ongoing gin trail, the town’s pubs have joined forces once again to help create a wonderful buzz for the bank holiday. Enjoy! On Monday last, 17 Castlebar publicans, bar staff and chamber of commerce members visited the Connacht Whiskey Distillery in Ballina. The trip included a guided tour of the distillery, followed by a tasting session in the distillery’s in-house bar, Mullarkey’s. There, the publicans enjoyed a spirits tasting paddle that included Straw Boys vodka, Straw Boys poitín, Conncullin gin (which is the Castlebar Gin Trail featured gin in the Irish House) and Spade & Bushel ten-year-old Irish single malt whiskey. Don’t be surprised to see poitín-based ‘Irish coffee’ in Castlebar this autumn! Many thanks to Ella, Grainne and Lyndsey from Connacht Whiskey and to Cathal and Betty Sweeney and staff for their hospitality. 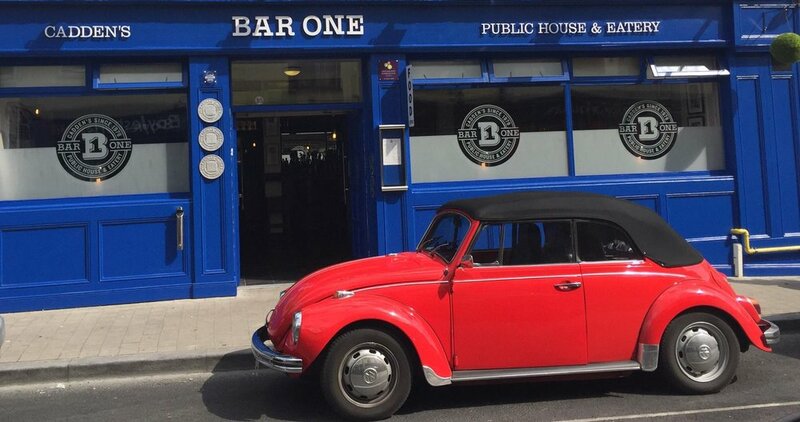 Win a gin experience as Bar One celebrates 15 years in Castlebar! To celebrate 15 years of business in Castlebar this month, Bar One is running some fantastic competitions. The prizes include a GIN EXPERIENCE FOR FOUR PEOPLE! Check out Bar One's Facebook page for details. Entrants must be 18yrs or over. T&Cs apply. Competition closes Saturday 22 July at 5pm. Winner will be announced that evening. Time for a skin and tonic as CollaGin hits Castlebar! Castlebar Gin Trail named as one of the top gin experiences in Ireland! Castlebar Gin Trail is back in the news as one of the top gin experiences in Ireland! Oh là là! There's a new gin in town! GIN TRAIL NEWS: There's a new gin in town! G'Vine Floraison is a fabulous French gin crafted with grapes and vine flowers and it's now being served (with pear!) in Bridge Street. The name Floraison means 'flowering', the key moment in the life-cycle of the vine and the perfect description for a gin that is fresh and floral, refreshing yet round and smooth, evoking the very essence of springtime in the vineyards, when the air is filled with fragrance of blossoming vine flowers. Its botanicals include juniper berries, ginger root, liquorice, cassia bark, green cardamom, coriander, cubeb berries, nutmeg and lime. Oh là là! Castlebar in County Mayo is seeking to establish itself as the Gin Capital of Ireland. The county town’s publicans have teamed up to launch Ireland's first permanent gin trail, which began on June 2, 2017 and will continue for the foreseeable future. The trail is being spearheaded by Castlebar Chamber of Commerce and local publicans, who are looking to put some added fizz into the town’s burgeoning social scene. The initiative is just the tonic for gin aficionados and newbies who are curious to learn more about the nation’s fastest growing tipple. Dozens of homegrown and international gins will be available on the trail, encouraging locals and tourists alike to try something new and to venture into the many pubs taking part. While dozens of Irish and international gins are now available in Castlebar, for the purposes of the trail each pub will specialise in one particular gin, offering it with a carefully curated premium tonic and garnish pairing. A bespoke trail guide and map make it easy for kindred spirits to follow the botanical path around the town.